With the much beloved Moro at its heart, London's first gastropub (by title anyway) just round the corner and a number of other notable eateries (including one of Londonist's favourite pizzerias), Exmouth Market is a much heralded foodie epicentre. So, when the wayward, scruffy and not terrible tasty Al's Bar closed to make way for newbie Antipodean resto-bar-roastery, Caravan, with New Zealander Miles Kirby (ex-Providores chef) at the helm, expectations were understandably high. Caravan's certainly better than the previous occupant. It's a light and accommodating dining space with prompt and friendly service. The menu is a perfect balance of intrigue and satisfaction - keep it in mind for weekend brunching when gluttons, gourmands and health nuts will all find suitable choices. The wine list, beers and booze are no fuss but well assembled. Coffee drinks live up to Kiwi standards. Most mains cost around £10 (portions are reasonable) with prices for starters, drinks etc falling inline accordingly. Without getting all snarky about it, there may be a few insignificant and fledgling kinks here and there for Caravan to work out (more toast please) but we really can't fault them for much and would be happy to return. 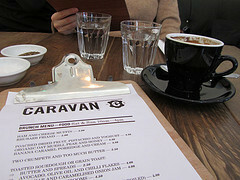 Caravan is located at 11-13 Exmouth Market, EC1R 4QD. Visit the restaurant online at www.caravanonexmouth.co.uk.